While some Main Streets seem well past their prime, others – like Corning’s – remain thriving to this day. Why? A lot of it has to do with the towns and cities in which they are located, of course; it’s hard to have a well-functioning Main Street in a down-and-out community. But there are also elements of design and context that matter. What are they? The answers matter to sustainability, because traditional Main Streets tend to have central locations and good walkability, both of which reduce carbon and other emissions associated with driving; over time, they also recycle land, buildings and infrastructure. 1. A superior pedestrian experience. Main Streets are for walking, browsing, lingering; while they should also be efficient for those looking for a particular item at, for example, a particular pharmacy or hardware store, they have to be highly walkable to succeed. This leads to a lot of potential design features, including ample sidewalks; convenient, well-highlighted crosswalks; vehicle traffic at calm speeds; entertaining, transparent storefronts abutting or very close to the sidewalk; relatively short block lengths; in particularly hot climates, shading. Motor vehicle traffic is very, very important: I think some of it is actually helpful to the experience, particularly if it draws customers to the street’s businesses and uses on-street parking, with the effect of buffering walkers from moving vehicles. Yet too much of it will kill the feel of the street for walkers. In particular, there should not be too many lanes of moving traffic so as to make street crossings inconveniently long; in most cases, two lanes of moving traffic, one in each direction, should be enough. 2. Density, but at human scale. A Main Street won’t be walkable without a significant minimum density. Yet it shouldn’t be overwhelming, leading to both vehicular and pedestrian congestion, diminishing the pleasure of a leisurely stroll and blocking light. Victor Dover and John Massengale, in their epic and highly recommended book Street Design, write eloquently about the best ratios of building height to street width. Personally, I like a mixture of building heights ranging from two to about eight or so stories. It’s all situational, of course: Fifth Avenue in New York City is a Main Street of sorts and can be terribly exciting for the pedestrian; but a two-story building would be way, way out of place there. That noted, Fifth Avenue is not the kind of smaller-scale, true “Main Street” I’m trying to describe today. 3. Viable local businesses. This one is tricky. So many macro- and micro-economic forces are stacked up against local businesses that I find it remarkable that some do, in fact, survive and thrive. Yet a “Main Street” with only chain stores and no locals (imagine the sort of “lifestyle centers,” outdoor shopping malls, really, that were emerging in the last decade) won’t feel sufficiently authentic to provide a rewarding experience. Some chains are fine, I think; it’s not the 19th century anymore. But not too many. And, while we’re on the subject of locality and authenticity, I must add that the best Main Streets I tend to encounter are found in places that have a bit of history to them (see my recent article on legacy architecture and continuity of place), and a local economy boosted at least in part by tourism. Corning’s Market Street feels that way: I patronized two restaurants and an art gallery on the street in my two days there, all local businesses; each time, the clientele seemed a mixture of locals and visitors. I should add that, although a successful Main Street need not be historic, it does seem to help if it is. Dover and Massengale’s Street Design devotes some 35 pages explicitly to Main Streets, with about as many photos; by my count, all but two (excluding illustrative drawings) are of historic streets. (The historic buildings are almost always repurposed, but the architectural fabric remains.) Yet one can find what I might call neo-Main Streets in newer developments, too. The highly successful suburban retrofit Bethesda Row includes a Main-Street-like environment that is exceptionally pleasant; so does the new (and beautiful) Atlanta infill neighborhood Glenwood Park, for which Dover’s firm served as master planners, though the shopping area there is not quite mature. But I think some degree of local businesses may be essential. 4. Nature. In a shopping district, a little bit of nature can go a long way. Some urbanist designers I know are fond of pointing to historic districts internationally (Florence, for instance), that have almost no greenery downtown. Ah, but look closely and one will see window boxes; hanging baskets of flowers; trees here and there. Our innate biophilic instinct is so strong that humans will find a way to add nature to even the most man-made of places. I maintain that cities need visible and functional nature, and Corning incorporates it beautifully in its street trees. Without them Market Street would not feel nearly so pleasant and alive. Corning also has a small square and park at the heart of the shopping strip. 5. Nearby residences. This is part of walkability, I suppose: I think it helps tremendously if there are residences right on a Main Street, ideally including apartments on the upper floors above the commercial storefronts. (I’m not sure if this is the case in Corning.) But the idea is to have enough residents living nearby to provide a steady clientele to the businesses. They can be supplemented, of course, by patrons who travel to the Main Street and walk once they are there, or by workers in nearby offices; but, if there are no residents at all living close enough to walk, I’m not sure you have a true Main Street. You have something akin to a quaintly designed shopping center. So that’s what I came up with. I’m curious what others might add to or subtract from the list. “We all know where our Main Streets are, but do we know what they are and why they matter? Whether they are named First Avenue or Water Street or Martin Luther King Boulevard, what they represent is universal. Main Street is the economic engine, the big stage, the core of the community. Our Main Streets tell us who we are and who we were, and how the past has shaped us. We do not go to bland suburbs or enclosed shopping malls to learn about our past, explore our culture, or discover our identity. Our Main Streets are the places of shared memory where people still come together to live, work, and play. The most important process elements for a successful Main Street revitalization are elucidated, in part, by a set of ten “national accreditation standards of performance,” each fleshed out with narrative discussion on the Main Street Center’s website. Corning, incidentally, was one of the first communities to participate in the Main Street program when the National Trust began its work on the issue decades ago. Many cities and towns have detailed Main Street design guidelines, and the state of Oregon offers a 105-page handbook on public infrastructure helpful to supporting good Main Streets. Dover and Massengale’s Street Design mostly teaches by detailing several examples of great Main Streets, but also includes a two-page set of design guidelines from retail expert Robert Gibbs on such matters as storefront design, signage, awnings (ten points on awnings alone! ), sidewalks, street furniture, and lighting. I can’t express it any better than that. 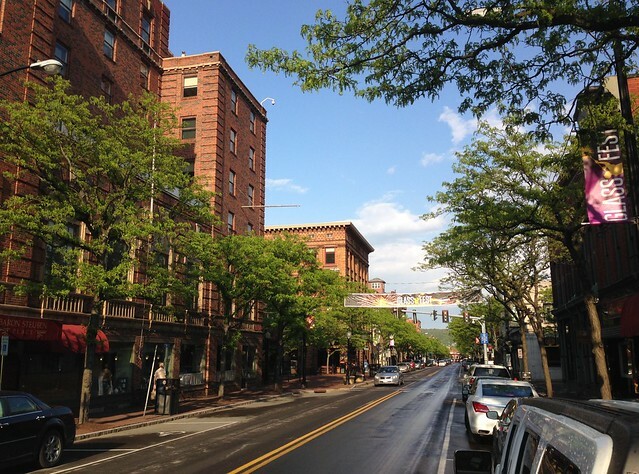 Corning’s Market Street is a great example. One could do a lot worse than emulating it, with the above five concepts in mind. Originally published on the NRDC Switchboard and now archived here. Republished with permission. All photos are of Corning, New York, ©2014 by F. Kaid Benfield. Photos devoid of pedestrians to illustrate an article on good main streets? I don’t get it. I think most of these photos were taken before the businesses were open, to illustrate the architectural designs, and so that the photographer wouldn’t have to track a bunch of anonymous people down to sign photo release forms for the website. Great article, and thank you for working to preserve the Main Street tradition. In every town I visit it’s the characteristics of the Main Street that form my opinion of the community at large. Those downtowns with the elements you mention above keep the town memorable in my mind. Those whose downtowns have been replaced by strip mall retailers and mega-parking-lot chains hold no uniqueness so why should I think of returning? In addition to the elements you list, I believe a thriving Main Street is one that is devoid of service professions. Restaurants, yes, definitely. But insurance offices, law firms, Quick and Loans, and the like do nothing to draw people down Main St. In fact, for many they are the first indication of a failing Main Street. Service industries belong on the side streets or on second stories above the businesses. Lastly, the greatest charm of local, privately owned businesses is their uniqueness. Because we are visual beings, the visible presentation of a business is hugely important, from the appeal of its building to the personality of its brand (logo, signage, ect.). A great Main St is one that offers eye candy to its pedestrians. I can’t argue with the author’s points (which have often been made before), but I’m struck by how little the design community (of which I’m a part) engages with the economic and management aspects of Main Street issues. We don’t look at data, preferring a more qualitative discussion. For example, what percentage of F&B is present on the most successful shopping streets? Service businesses vs. “boutiques”? What roles do BIDs or other merchant associations play? Landlords? Cultural institutions? Municipal financial incentives? Can one “program” an ideal tenant mix when confronted with multiple independent owners? How much parking is required? Of what type? If we could achieve a shared database of all the factors that go into Main Street success (ULI’s case-study program is the closest I know of), we’d have more powerful tools for promoting rational public policy in this arena. My mother, Virginia Wright, was instrumental in prompting the “retrolution” of Market Street, and when the Corning area was devastated by a flood in June 1972, this project moved forward. She and my father, Jerry Wright, are still living in Corning, and until recently, resided in Academy Place, apartments created in Corning Free Academy (where I was attending 8th grade when the flood hit). A surprisingly detailed article about those times can be read here.